Another terrific looking book about religious history in Great Britain which also delves into some sociology of the religious “awakening” — this one by David Bebbington (Stirling), Victorian Religious Revivals: Culture and Piety in Local and Global Contexts (OUP 2012). An especially interesting feature of this book looks to be the study of the structure or organization of the revival, which is perhaps in some cases less spontaneous than one might believe. The publisher’s description follows. Revivals are outbursts of religious enthusiasm in which there are numerous conversions. In this book the phenomenon of revival is set in its broad historical and historiographical context. David Bebbington provides detailed case-studies of awakenings that took place between 1841 and 1880 in Britain, North America and Australia, showing that the distinctive features of particular revivals were the result less of national differences than of denominational variations. These revivals occurred in many places across the globe, but revealed the shared characteristics of evangelical Protestantism. 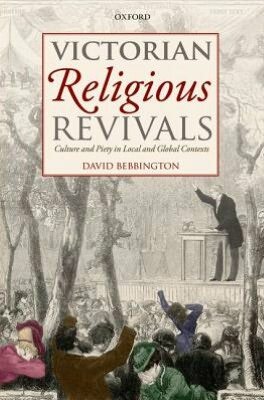 Bebbington explores the preconditions of revival, giving attention to the cultural setting of each episode as well as the form of piety displayed by the participants. No single cause can be assigned to the awakenings, but one of the chief factors behind them was occupational structure and striking instances of death were often a precipitant. Ideas were far more involved in these events than historians have normally supposed, so that the case-studies demonstrate some of the main patterns in religious thought at a popular level during the Victorian period. Laymen and women played a disproportionate part in their promotion and converts were usually drawn in large numbers from the young. There was a trend over time away from traditional spontaneity towards more organised methods sometimes entailing interdenominational co-operation.